I’m cheating a bit today, because I actually took this picture earlier in the week. It’s Britain’s quintessential derelict building, Millennium Mills. It’s on the south side of the Royal Victoria Dock in London, just across from the ExCel exhibition centre. 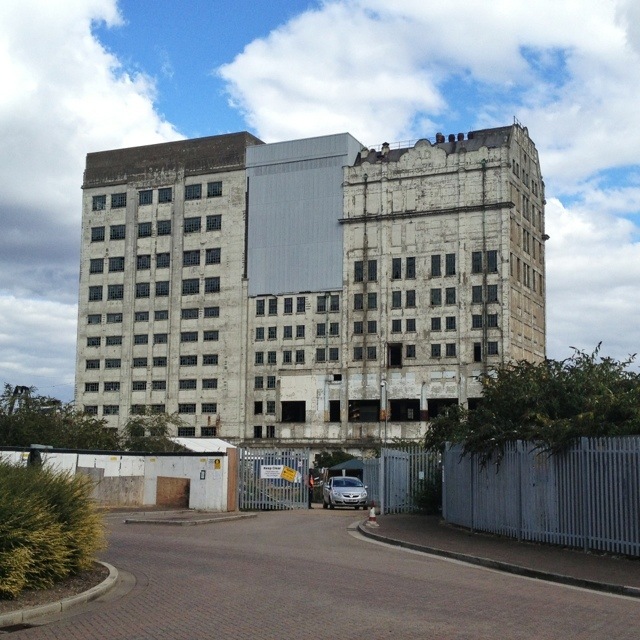 The building has played the role of “derelict building” in any number of TV shows, films and music videos, from Ashes to Ashes to Green Zone. It’s one of those buildings that, when I walk past it, makes me desperate to explore inside. Of course, the law-abiding and safety-conscious side of my brain ensures that the nearest thing to urban exploration that I ever do is logging on to 28 Days Later and looking at others’ fascinating photographs. In this case, it’s probably a good job: the place is full of asbestos, floors which are decayed to the point of collapse, and nine storey drops. It’s definitely not a good place to go exploring! The future of Millennium Mills looks uncertain at the moment: many plans have been made, from converting the building to luxury flats, to demolishing it and building an aquarium. All have fallen through. So who knows what’s next for this beguiling building? This 1,819th post was filed under: Photo-a-day 2012, London.